The right to pray by all is under threat from the mid 90’s in this country. In the aftermath of particularly violent outbursts, the statistics come to the fore. In the interim, the slow burning fires continue their work in this country. 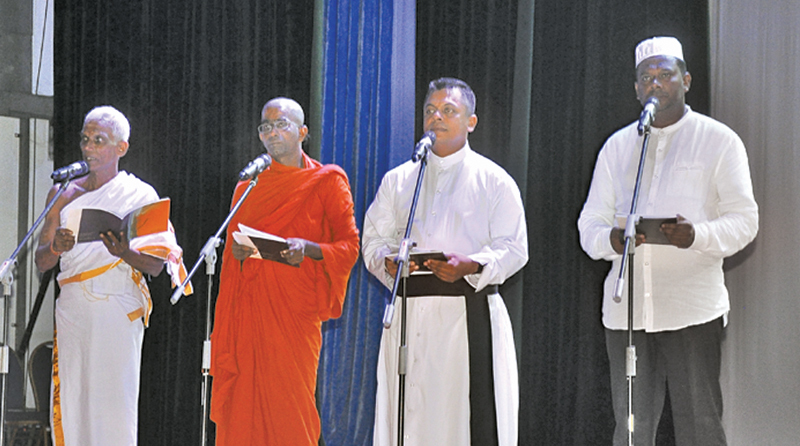 Very recently, this writer came across an ongoing situation in which a member of the clergy had summoned another from a different faith, been rude and boisterous and demanded that all construction work on a land owned by a particular group be stopped, sell the land and leave the area as he does not trust that group as they convert Buddhists. He had further threatened that if the preacher were to fail to follow his orders, the consequences will be serious and he will not be responsible. He had brought the villages to the temple that afternoon and visited the site with about 25-50 people that evening and instructed the neighbours to boycott the preacher and to stop giving water and any other help. This story is replicated scores of times. Three-quarters of the world’s people live in countries that either restrict the right to religion or belief or have “a high level of social hostility involving religion or belief,” the U.N. special investigator on religious rights has said. Ahmed Shaheed told the General Assembly’s human rights committee that religious intolerance is prevalent globally - and rising around the world. He said over 70 countries currently have anti-blasphemy laws that can be used to suppress dissenting views, in violation of international human rights standards. For the groups in pray it is a terrifying existence and a crude and sacrilegious violation of an inalienable right of every human being. Rev. Duleep de Chickera, at a panel discussion on the topic ‘Religion Reconciliation and Future’ had these words of wisdom. “It is vast, it is varied, it is controversial, contradictory and complex. During different periods in the history of human kind, religions have gone like this; up and down, spreading conflict, discrimination, initiating violence against people and cultures and other religions and so on.If religion is to impact in the process of reconciliation there are one or two aspects of conflict that religion must try and comprehend. The first, again stating the obvious, is that conflict recurs – whether it is personal or social. So within history, we are not going to reach a state in which there will be no conflict. Consequently, the responsibility of religion is to respond to conflict in such a way that if there is grievance it is addressed and justice must be done. “If there is potential to harm that must be reduced or eliminated, if there are lessons to be learnt, they must be learnt. And there must be growth as far as possible, of the different segments that belong to that particular society. Humans are built on values. So that they will respond to good and evil, in such a way that, evil will be dealt with the way evil needs to be dealt with and good survive and good will be able to be sustained. “So the formation, the writing of values, into the personality and character of people is an investment, that religion is compelled to make, if religion takes reconciliation seriously. “If there are extremists within the Christian church it becomes the primary responsibility of moderates within the Christian church to address them. And to address them in terms of Christian doctrine and teachings of Christ, and so on. Similarly in Islam, similarly in Buddhism and all other religions, Hinduism included. Currently followers under threat cover in private dwellings, helpless and fearfulof religious intolerance and violent attacks. The Police have a thankless task of separating groups and maintaining peace. We are not making much progress. However people of many faiths, in times of trouble seek divine intervention and guidance. They cross boundaries of their own original faith. Some whilst retaining their original religious identity, whilst others assume new faiths. Even if they don’t, people visit places of worship of other denominations to pray. It’s an ongoing process which no clergy can police. The clergy must also not acquire powers of policing. Common law must apply to all including members of the clergy. In very many instances where prayer groups are under attack, they choose a non-confrontational path of deference to those objecting to their right to choose a faith to pray. It emboldens the aggressive attackers to further acts of violence. This scourge of religious intolerance being a global phenomenon will not leave us alone in the immediate future. If we were to remain indifferent to the ramifications, it will grow and provide fodder for significant civil strife in time to come soon. Section 290: Injuring or defiling a place of worship with intent to insult the religion of any class. Section 290A: Acts in relation to places of worship with intent to insult the religion of any class. Section 291: Disturbing a religious assembly. Section 291A: Uttering words with deliberate intent to wound religious feelings. Section 291B: Deliberate and malicious acts intended to outrage religious feelings of any class, by insulting its religion or religious beliefs. The promotion of greater religious tolerance and pluralism bridges mistrust between the different religious communities and ethnic groups though promotion and awareness of cultural diversity learning of each other’s’ languages, religion cultures, beliefs is what we need to be doing. The formation and the writing of values referred by Rev. Chickera earlier is so essential. This is common sense. Legislation alone is not enough. A comprehensive approach is needed, including preventive measures, dialogue, education, promotion of tolerance and pluralism.